‘Everything about it reminded me of you. You’ll love it!’ she insisted, maneuvering my fingers until they held the small possession that radiated such excitement from her eyes. Upon examining the jacket more closely, I saw it was written by Jon Ronson and sighed in great relief. The Men Who Stare at Goats was such a fabulous read that appealed so directly to my humour that my friend’s connection finally made perfect sense. At least, that’s what I convinced myself. 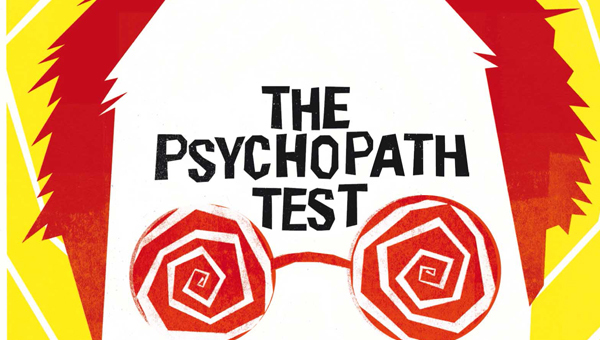 From the very outset, Ronson makes it clear that the book essentially came about by mistake, but upon questioning what it was that actually makes a psychopath, there was simply no turning back. He looked into how “psychos” were defined as well as how they were tested, treated and viewed by all those around them. As a result, a proverbial can of worms had been opened. As his research brings him into contact with a host of people who have been officially diagnosed, he is surprised to find that most of them seem perfectly normal. Some, in fact, are remarkably charming, making the line between who in the world might be deemed technically insane uncomfortably blurred. Throughout Ronson’s project, he injects large doses of his own delightfully wicked humour, but in exploring whether we live in a society that occasionally rewards people with psychopathic tendencies and placing them in highly influential areas (psychopaths perform far better under pressure) he creates an absorbing read that sparks a rather stirring debate. Provocatively, it leads us to ask how we ever truly know when a psychopath is among us and how many of them are currently making decisions through professions such as banking and politics, that affect us all. Jon Ronson uses his journalistic background to deliver a piece of work that is both hilarious and disturbing, and never before have I read something that so equally combines the two. Can it be that psychopaths and sociopaths are at the heart of everything? Do they secretly run the world? And is there really a solitary test that can accurately identify them? Read the book and decide for yourself. If you’re anything like me, you will find it an exceptionally captivating read. Funny, insightful and incredibly disturbing! Will live long in the memory. * Follow Jody’s author profile at Goodreads. My brother suggested I may like this blog and, for once, he was right. Your articles truly made my day! You have no idea how long I’ve spent looking for these answers. Thank you!